Welcome to my first foray into the blogosphere. Bear with me I’m completely new to this. I hope to bring you ideas, news, views and perhaps a little original artwork when work and family commitments allow. So, what to cover in my inaugural post? I think the story behind this blog’s title would be as good as place as any to kick off. Dracovenator is a desperately fragmentary theropod dinosaur from the Elliot Formation of South Africa. 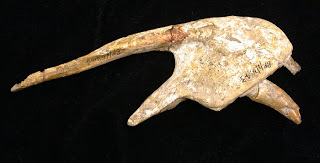 The specimen consists of just the premaxillae (bones from the tip of the snout - see photo) a fragment of maxilla (the main upper jaw bone) and some small pieces of lower jaw, including a chunk from the jaw joint. Incomplete though it is, it is special to me. I didn’t excavate it, but I did recognise it, describe it and bestow it with its scientific name. I found Dracovenator one day in 2004 during one of my occasional work-avoidance trips to my favourite field areas – the basement Karoo fossil store at Wits University. This marvellous store of palaeontological treasures is largely the result of a lifetimes collection by the remarkable James Kitching. I could write pages about this ‘man with the x-ray eyes’ and his uncanny ability to find fossils where few others can (and from such unlikely places as up in a helicopter or on a train at full speed) but for the purposes of brevity I will simply mention one fortunate character trait – he lacked interest in dinosaurs. This meant that all the wonderful dinosaurs he found while looking for other vertebrates that lived alongside them in the Karoo were dutifully collected but left largely unstudied. My palaeo career has had more than a helping hand from sorting through the material James collected. While randomly opening boxes in the ‘thecodont’ section of the collection I came upon a box containing the label “?Erythrosuchus, Upper Elliot Formation” . WTF? Erythrosuchus is an early Triassic archosaurfrom the Burgersdorp Formation, whereas the upper Elliot is Jurassic in age. I quickly delved into the paper towelling that wrapped the specimens and pulled out a stunningly well-preserved and complete theropod premaxilla. It looked at first glance like the premaxilla of ‘Syntarsus’ the only theropod taxon known from the Elliot Formation at that time, only this specimen was many times larger. A new giant coelophysoid from South Africa, that’s not something you find every day. Dracovenator translates to ‘dragon hunter’ which seemed like an appropriate name from this predatory dinosaur that comes from near the foothills of the famous Drakensburg (‘Dragon Mountain’) Range, in South Africa. It is currently thought to be a ‘dilophosaurid’, a small group of just four species of theropod dinosaurs from the Early Jurassic of, well, the world (definite finds so far in North America, Asia, Antarctica and Africa, although I suspect fragments from Europe probably belong here as well). The name ‘Dilophosauridae’ has not officially been named in print but really ought to be. What’s especially interesting is that recent analyses (starting with Oliver Rauhut’s 2003 magnum opus) have found them to be more closely related to ‘advanced theropods’ than the archaic coelophysoid theropods they were ‘traditionaly’ associated with (I am speaking here of a tradition extending back no further than the mid 1980’s). This makes them significant for two reasons. Firstly their basic ‘coelophysoidyness’- elegant slender bodies, long low skulls, a distinct kink in the jawline between the two bones of the upper jaw (premaxilla and maxilla) and paired crests (of variable height) atop the snout – indicate that this was the basal condition for theropod dinosaurs (excepting the really basal things like Herrerasaurus if that is a theropod at all). In other words the great ancestor of all theropods from Coelophysis to Tyrannosaurus to Hummingbirds would have looked very much like Coelophysis itself. Dilophosaurids also help to reduce the gap in the fossil record between coelophysoids, (which first appear in the Late Triassic) and advanced theropods (which don’t make a definite appearance until the middle Jurassic*). We no longer need to postulate a missing lineage of advanced theropod fossils extending back to the Late Triassic alongside the coelophysoids. They could have easily branched from the dilophosaurids at any time in the Early Jurassic, just before they show up as fossils in the mid-Jurassic. * Berberosaurus may be an Early Jurassic ceratosaur, and thus part of the ‘advanced theropod’ clade that I am referring to. However I’m not yet convinced, it could be another dilophosaurid. Notably, when the analyses finding non-coelophysoid Dilophosaurus are combined with those finding coelophysoid Dilophosaurus, the latter topology wins out by 7 steps (unpublished results). Now whether they coded characters correctly or used independent characters is another question. And 7 steps isn't much at all, so I consider the verdict still out in any case. Dilophosauridae was first used by Charig and Milner (1990) to refer to Paul's (1988) informal dilophosaurs, which he actually used the subfamiliy Halticosaurinae for. Madsen and Welles (2000) mention a Dilophosauridae used in the same sense as Coelophysoidea. However, they then state Dilophosaurinae should be a subfamily of Podokesauridae containing only Dilophosaurus. Finally, they show an indented table with Dilophosauridae containing only Dilophosaurinae, with Dilophosaurus its sole genus. References- Paul, 1988. Predatory Dinosaurs of the World. Simon & Schuster, New York. Charig and Milner, 1990. The systematic position of Baryonyx walkeri, in the light of Gauthier's reclassification of the Theropoda. in Carpenter and Currie (eds.). Dinosaur Systematics: Approaches and Perspectives. Cambridge University Press, Cambridge. 127-140. Madsen and Welles, 2000. Ceratosaurus (Dinosauria, Theropoda) a revised osteology. Miscellaneous Publication 00-2 Utah Geological Survey, 80 pages. Oh, and congrats on the blog! I intend to check it often. Hi Mickey and thanks for dropping by. So a coelophysoid Dilophosaurus still wins in a big combined analysis heh? I find that somewhat surprising given that the analyses that find it as a non-coelophysoid were pretty inclusive to start with.